Permaculture Institute is rolling out the Permaculture Community Awards to encourage an atmosphere of professional excellence among Permaculture designers, educators, and community organizers in an effort to recognize and reward outstanding achievements of Permaculture Design. Permaculture Community Awards invites colleagues to take care and time to honor each other for their great works, thereby fostering a broad-based Permaculture community. An annually rotating review panel of Permaculture Diploma holders, recognized experts in the field, and Permaculture students vote on the nominees. Five awards are issued each year, in a broad set of categories. SHARE…this project with your Permaculture colleagues, students, and friends. We all have a stake in ensuring outstanding work is representing the Permaculture community. NOMINATE…your colleagues, students, and friends who are doing exceptional work with Permaculture Design in their communities. Thank you for all your efforts in contributing to a professional Permaculture community. This effort is for you, to reward and encourage exceptional Permaculture work! About Permaculture Institute: Permaculture Institute is a federally recognized educational non-profit organization with mission to promote permaculture through education, demonstration and community building. Founded in 1996 by Scott Pittman and Bill Mollison, Permaculture Institute strives to uphold educational standards and professional excellence in the permaculture movement in the Northern and Southern Americas. Tentatively Scheduled for Saturday July 19th, 2014 9:00 a.m. to 5:00 p.m.
What: Participate in most phases of rabbit ranching in your backyard, including feeding, housing, growing, skinning, and butchering rabbits for food and fur. Financial requirements: $50 nonrefundable deposit per participant/family payable by check/cash to Darlene Nixon by July 1, 2014. Tuition for each person/family is $130.00 (less the deposit) if paid by July 12th, 2014. $50 will buy you a processed rabbit and finished pelt. If you cannot make the workshop after the deposit is paid, you can make arrangements to pick up your meat and pelt any time afterward. If you want more than one rabbit for the workshop you may pay an additional $10 for the deposit for each rabbit you would like. After July 12th, participants may register by paying the entire tuition of $150.00, including their deposit for a rabbit and a pelt, if room is available. Morning session 9:00 a.m. Meet at Chiron Therapeutics for rabbit harvest session. 9-11:30 a.m. Slaughtering, Skinning, and Butchering rabbits. All materials and equipment provided. In this session I will demonstrate dispatching a rabbit with a Rabbit Wringer and Deluxe Butchering Station. Each person will have a turn using this equipment to decapitate, hang, skin, and eviscerate their rabbit. Then we will move on to ways to break down the meat, preserve edible organs, and prep the pelts for curing. I will have pelts on the site that are in various stages of curing, including mixing up a batch of pickle for demonstration. I will also have pelts that need de-fleshing. Everyone will have an opportunity to participate in each stage of the pelt preservation process. I will have vacuum sealer bags and equipment to vacuum seal those meat/organs and the fresh pelts for taking home to process. We will pop them in the freezer in the afternoon. Lunch and transportation to the afternoon site in Shannon Estates neighborhood: 11:30 a.m.-12:30 p.m. If people want to come to eat at the site, I will take $10/person to eat rabbit stew and fresh veggies from my garden. Please bring your own beverage and place setting—a no waste event—plate/bowl, utensils and drinking vessel. Afternoon session: 12:30 p.m. Meet at AWholesomeHomestead.com for rabbit care, housing, feeding, breeding and treating for illness/injury. 12:30 – 1:30 p.m. Tour the rabbitry, while observing the different breeds, ages of litters, feeds used to help pregnant and nursing does, litters under one month of age, non-breeding rabbits, breeding bucks and dealing with the midday heat and sunlight. Watering, foraging and sources for organic feed will also be discussed. 1:40 p.m.-3:00 p.m. grooming, and caring for rabbit health/happiness. Water! Chewing! Exercise! Hygeine! Play! Predators, pests and property. Making homemade rabbit chew toys. Discussion of non-residue supplements, herbs, and homeopathic medicines. 3:10 p.m. – 5:00 p.m. Breaking dried pelts and conditioning them. Discussing recipes and uses of rabbit pelts. When the deposit is received, I will mail out a waiver of liability to be signed and returned by each participant before or at the time of the workshop. Each participant in the butchering and pelt processing will have to bring safety equipment: Goggles, rubber gloves, work aprons, long sleeved tops, leather work gloves, closed toe leather shoes, and full length pants. Fingernails must be clipped short, and long hair restrained. Move beyond going green and living sustainably. Gain the deep knowledge you need to restore your world in CRMPI’s pioneering 5-week, 5-course immersion training! This will be one of the most in-depth Permaculture Programs currently offered anywhere, taught by leading professionals in the field. July 26th-28th – Guided tours of nearby permaculture & sustainable agriculture operations. Funding has been made available through Senate Bill 14-179 to the Stream Restoration Grant Account within the Flood and Drought Response Fund for watershed cleanup and stream restoration in areas affected by the September 2013 flood. Both private and individual entities are permitted to apply. Awards will be based on planning and project efforts, which integrate multi-objectives in restoration and flood mitigation. Projects may include designs to reconfigure channels, remove debris from the stream channel and/or floodplain, provide habitat for aquatic and terrestrial species, re-vegetate riparian areas, mitigate flood hazards, improve recreational opportunities, provide fish passage, and increase the capacity to utilize water. Completed applications are due by 5:00 pm on July 1, 2014. Here is an historic opportunity to participate in a continental Permaculture Convergence! Details and website link below. EVERY PERMACULTURIST IN NORTH AMERICA IS INVITED! Old and young, Experienced and newcomer!! action teams and the Permaculture Exposition. This very first North American Permaculture Convergence offers a special opportunity to meet up to 1,000 permaculture movers and shakers from across North America to share our successes and strategize how to create a permaculture future. People will have different reasons for attending NAPC. For me, I view NAPC as a tremendous networking opportunity to meet permaculture movers and shakers from across the continent. As one of the permaculture movement’s historians I am also excited to use NAPC as an opportunity to collect more permaculture history. 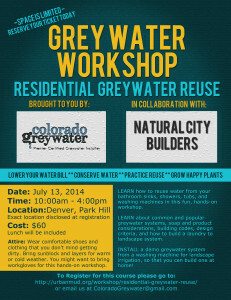 LEARN about common and popular greywater systems, soap and product considerations, building codes, design criteria, and how to build a laundry to landscape system. 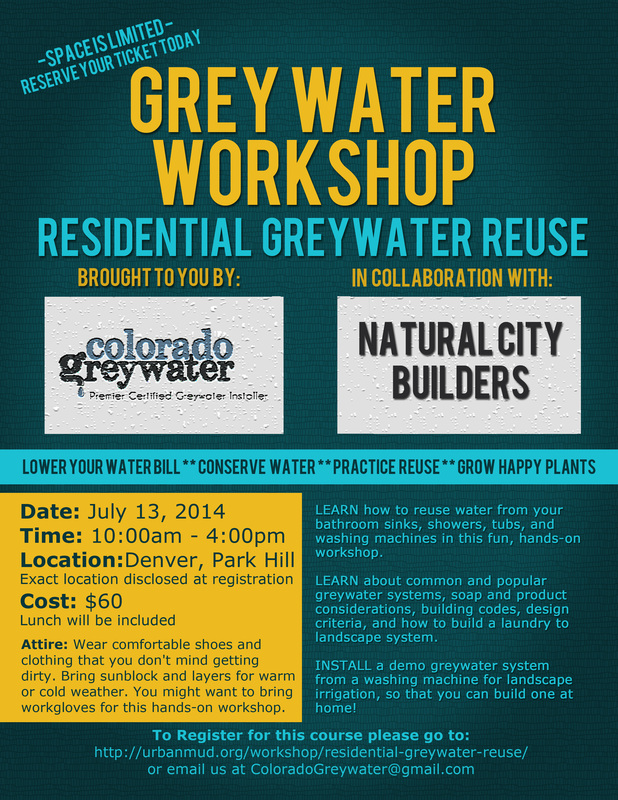 INSTALL a demo greywater system from a washing machine for landscape irrigation, so that you can build one at home! In August, Natural City Builders, Regenerative Lifestyles and Radish Collective will be hosting the Village Design Course, a 4 day intensive for community building and making public spaces useful, all the way from Portland, Oregon! This unique opportunity will be taking place this August in both Denver and Boulder! More info to come, please see website to register and contact us with any questions! Hope to build with you all very soon!